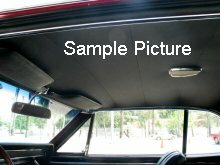 All 73-77 GM Models with sewn type headliners, are supported with plastic "T" hangers instead of conventional metal rods and are included with the headliner. These headliners are shipped in a 4"x4"x54" box, approx.wt. 5 Lbs. All models have molded plastic panels below the headliner so no separate panels or headlining material is required.